FOJA is a volunteer-operated organization. Through the generosity of the public and committed volunteers, we have been able to save 1000ʼs of animals. If you have interest in becoming a part of FOJA or supporting our programs, please contact us! Friends of Jacksonville Animals (FOJA) is a 100% volunteer organization. Without volunteers, we simply wouldn’t exist. 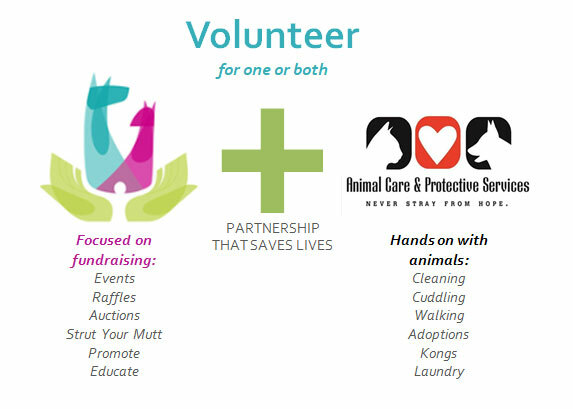 Our volunteers help with the business of running our organization, help with fundraising and educational events, coordinate donation drives, and assist with other programs that support the shelter. Our volunteer opportunities do not involve working hands-on with the shelter animals. Only ACPS-approved volunteers work with animals. That said, many of our volunteers are with both FOJA and ACPS so we work hand-in-hand. If you are interested in ACPS, please fill out their application online. We are always thrilled to have animal lovers helping FOJA and hope to see you soon! Do FOJA volunteers get hands-on with the animals? No. FOJA volunteers do not NOT work directly with animals. We are a fundraising organization that supports the municipal shelters in Duval County. We do not accept animals or send them to foster. Sometimes, we hold events with adoptable dogs present. In that case, you need to be both an ACPS approved volunteer as well as a FOJA volunteer to handle animals. Can I use high school/college/community service hours with FOJA? Maybe. FOJA events are scattered throughout the year and not held on a regular basis, so we may not be able to fill those hours in the timeframe you need. If you are underage, our opportunities are limited. See next question. Can I volunteer if I'm under 21 years old?Technically, yes. However, many of our events are held at establishments that serve alcohol and may have an age restriction. For under 18, our opportunities are currently pretty limited, but we are looking into forming a “FOJA NextGen” to start our younger animal lovers in fundraising, but it is only in its beginning stages. You are encouraged to fill out the FOJA application, but be aware it may be many months before we have opportunities for you. What are the age rules for volunteering?